Fortunately for me, my fishmonger takes a vacation once a year. And the day before, they sell all of their fish at a 50% discount. Fresh fish just won’t last the week, you know. I’m generous with the crab cakes and can get four of them to a pound. Like barbeque, crab cake recipes are a matter of individual and even regional taste. In my opinion, they just aren’t the same unless the meat is from the Blue Crab. So if you’re going to invest, I thought you might like the best recipe in the world to prepare yours. Like the blue crabs themselves, this recipe comes from the Eastern Shore of Maryland, from a place that was once little more than a shack at the end of a pier, The Oxford Carry Out. Salt, pepper, and fresh chopped parsley to taste. 1 lb. of jumbo lump crabmeat. Form the crab cakes by hand, handling as little as possible. Fry in oil or butter. As a kid, I would eat sandwiches made with crabcakes, a hamburger bun, coleslaw and a pickle. They are still the perfect summer food. This particular evening, I fried two and broiled two after spraying them with a butter flavoured cooking spray. The fried cakes broke up a bit (cook’s error on turning), but would have made easy and tasty sandwiches nonetheless. The broiled version looked much prettier and held together better. I served the crab cakes on a bed of roughly torn Romaine lettuce leaves with a splash of Balsamic Vinaigrette and freshly cracked pepper for a more elegant, if less traditional, presentation. A word of warning, once you start making your own using this recipe, you will become very critical of those served at most restaurants. At current market prices, however, you would be paying about USD$30 a crabcake or more. Fortunately, they go great with cold beer. 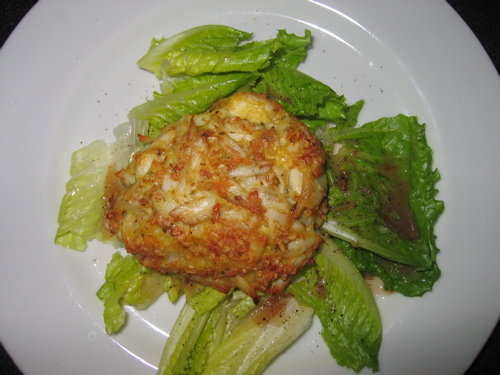 This entry was posted in Entertaining and tagged crab cakes, recipes, summer. Bookmark the permalink. My mother uses crumbled saltines for the binder. I used to get fresh crab meat from Smith Island when I worked for the Chesapeake Bay Foundation. Too bad I am allergic to crab these days. Delicious! Crab cakes are one of my many weaknesses. I had a horrible experience settling for less than the best, and I went around asking everyone to give it the “sniff” test and when I began to cook them, that was the tip off! Never again, now I will spend extra for fresh. Better to be snappy than totally crabby! My mouth is watering just looking at this picture. a) Panko: I use it, too. It’s crispier and less stodgy than anything else I’ve tried. b) No chopped up veggies. Why would you include them anyway? If you really chill the cakes before you cook them, they’re less likely to fall apart. Claire is a woman after my own heart – vinho verde is perfect! We’ve just come off crab overload, but the commercial season has started on the west coast of Canada, so no more trapping for us. Unless it’s fighting fresh and simply prepared I don’t want it anyway. I’m off to the Eastern Shore tomorrow for a family reunion in Oxford. I hear that there will be a bushel or two of blue crabs waiting! One of the greatest laments of my old age (37) is no longer being able to tolerate crabmeat. Without fail, I would order crabcakes at my favorite restaurant and at our club, and would feel quite green within 30 minutes of consuming them. This recipe is a good one; the less one adds to fresh lump crab meat, the better. That said, I believe it is critical for the cakes to rest in the chiller for no less than one hour before sauteing them. The cakes are guaranteed to stay together following this step, and not fall apart. Once, as an experiment, I dusted each cake with panko crumbs then deep fried them in my Waring vat. The results were incredible. TTI, that’s horrible! Hope you can tolerate a good lobster salad.